As a working scientist, publications keep you employed, and employable, and in our case, good field data was vital fuel to these publications. We had invested a lot of time, effort, and ultimately reputation (not to mention risk) in our fieldwork, and this led to a degree of friction with what we inevitably saw as the quixotic, ego-driven Amundsen’s Tent sideshow. It was something we were happy to co-exist with, but when it became clear later in the day that practically everything, up to and including the safety of the expedition team was secondary to The Tent, it led to serious tension and strong words. I am still convinced that it was largely due to the insistence of the Aurora’s captain to depart immediately that a disaster was averted. As the ship sailed rapidly north, it was ploughing through slushy frazil ice that would very soon turn to solid sea ice. The Aurora was not able to break through such ice, and furthermore was easily the last ship in the region. A few days later could have seen it stuck fast. This was a fate which Kristensen only just escaped several years earlier in the Ross Sea, in similar circumstances. It was not a situation which an experienced polar expedition leader should have gotten into, and certainly the kind of risk which Amundsen himself would have avoided. Some of the story of the Aurora field season had preceded us on our return to the UK, and the Establishment’s tenuous relationship with the Programme had all but broken down. It seems that various agreements had been broken, various bills unpaid, and everybody wanted to wash their hands of any involvement. On the scientific side it was, perhaps, a qualified success, but it was clear that there was to be no repeat, and the foundations we had laid were not going to be built upon. In some ways the judgements were unfair. The fatal blow to the Aurora Programme was probably struck by the combination of airfreight delays and the Montevideo dock workers. These and the later problems with sea ice seriously curtailed the time remaining. Then again, without the dock strike we’d probably just have got stuck in sea ice earlier and longer. The other issues included over-ambitious goals, underfunding, and a ship right at the extreme edge of its effective range. The Aurora Programme was sometimes unlucky, but all Antarctic expeditions need to factor in a lot of contingency. And actually, one could also argue that when it really mattered, we had been very lucky indeed. All in all, the operation was a toxic blend of brilliance and neglect. The staggering feat of actually getting the expedition off the ground and overcoming all of the obstacles placed in its way to get into the field cannot be overstated. The Blaenga base was a masterpiece of Norwegian ingenuity and logistic skill. Monica’s logistics manager can take a lot of credit for the way he managed such a disparate group of people with humour and patience, but there was no question at all that the driving force was Monica herself. But on the other side, the scrappy surveying of the Twin Otter’s fateful depot strip was unthinkable. Any other field party would have checked, and checked again, ten times over, and marked out a perfectly safe strip, before asking an aircraft to land in such critical circumstances. Later in 1992 we presented the results of our field work at the first ERS-1 congress in Cannes, France. Although our new Department Head was not particularly impressed - he was of the opinion that theoretical modelling could solve everything - my talk on the range validation of the radar altimeter was well received, and at least one eminent remote sensing scientist went out of his way to commend our methodology. The work helped to lead to a three year European Commission funded project which I led to establish a climatological baseline for the Filchner-Ronne Ice Shelf. Jeff’s work with the scatterometer and associated experiments led to two published papers, which was a pretty good result. 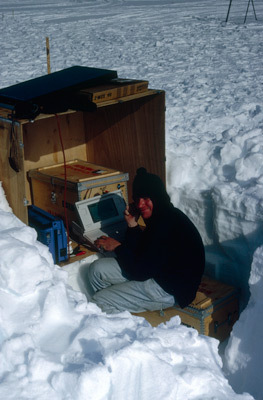 Jeff Ridley in his improvised field laboratory. Although I criticise the “Establishment” for its lack of support for the Aurora Programme, in one very important respect, this proved to be sadly justified. The crew of the Aurora, although perfectly ok people, were normal Norwegian sailors. 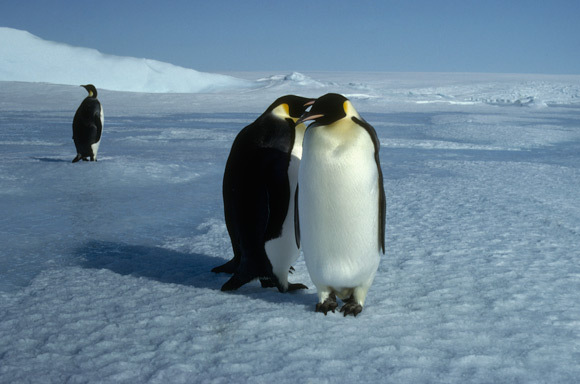 They had no understanding of, or interest in, the Antarctic Treaty. Wildlife protection was not a concept they were sympathetic with, and waste disposal basically meant chucking stuff overboard, even in Antarctic waters. When this became known back in Norway it caused quite a scandal, and as Expedition Leader, and owner of the vessel, Monica Kristensen had to take responsibility for this. But as a woman, even in Scandinavian society I’m not sure she had much sway over the seamen. 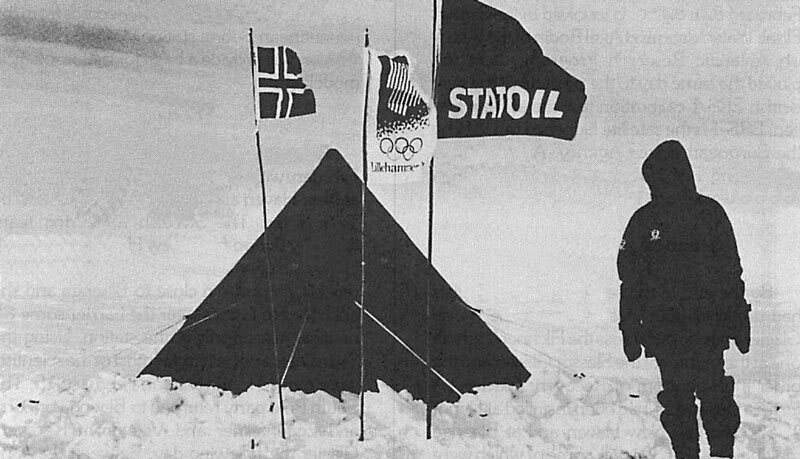 In 1993/94 Monica Kristensen made a further attempt to reach Amundsen’s Tent, this time without the hindrance of a scientific programme. I assume she and her team departed from Blaenga, but I have few details. Apparently they wanted to fly an excavator to South Pole to dig and the area they claimed to have found a cavity. This again required laying fuel depots for an aircraft, and this time it went badly wrong. In fact I have very little knowledge of exactly what transpired, but I do know that it ended in tragedy, in the Shackleton Mountains, with the death of Jostein Helgestad [uRL] in a crevasse field. The report from the United States Antarctic Programme [URL] (USAP) team which rescued the 4 person party, hundreds of miles from the Pole, makes it bluntly clear that they had put themselves, and the USAP personnel, in considerable danger. It also states that the Kristensen party had no idea of how to travel over crevasses, or how to rope up. I find this quite hard to believe - Monica herself certainly had plenty of experience of overland polar travel. 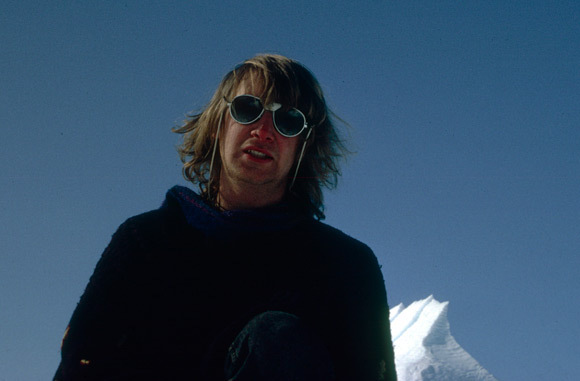 However, it does correlate somewhat with an experience I had on Filchner Ice Shelf, where our team had encountered a mildly crevassed area near Snowhenge and roped up to cross it, using techniques I was taught at BAS. A Norwegian party which had joined us for a few days looked at us in disbelief, jumped on their snowmobiles, and simply accelerated hard, trusting in momentum to cross any rifts. These days I have little contact with my former crew-mates. Jeff Ridley now works at the UK Meteorological Office, and has helped me with writing this saga. 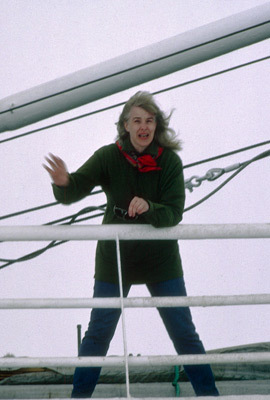 Elisabeth Isaksson is now with the Norwegian Polar Institute in Trømso. Me, after developing what I thought was an interesting proposal to explore past behaviour of ice streams as proxies for climate change, backed by senior colleagues of the Australian Antarctic Division, was not given any support by my boss, I decided I’d had quite enough of academic backstabbing and went off to enjoy industry backstabbing instead. Probably I should have dug my heels in, but what the hell. I don’t think Blaenga was ever used again - I think not. However, I have found a photo on the web of one of the huts deeply buried in snow, in 1996. Quite a sad sight. 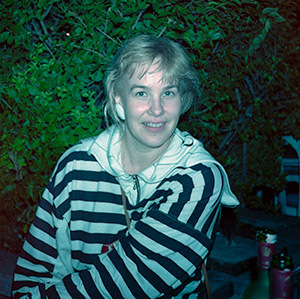 Monica Kristensen, it seems, ended up in some kind of exile as the manager of a mine in Svalbard. These days, however, she has reinvented herself as a successful writer of Nordic crime thrillers - so far only translated into German as far as I can tell. But I doubt that she’s ever contrived a tale of a character quite as unique as herself. 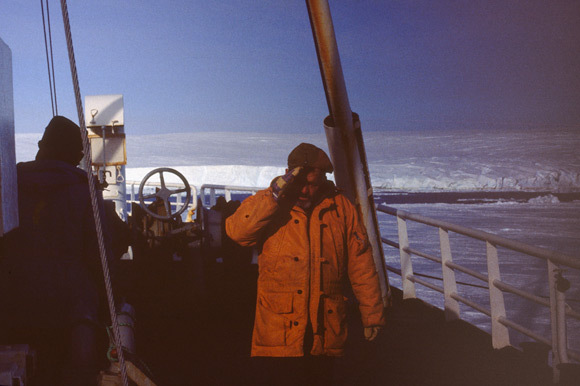 This article is the third in a 4-part series about the Aurora Programme, a privately-funded expedition to Antarctic which took place in the 1991-1992 austral summer/autumn. Read Part 1 here, and Part 2 here. The Aurora’s hold was pretty full. 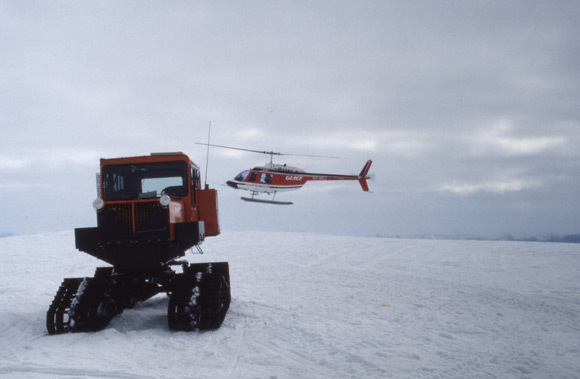 Apart from the science and logistics equipment, there was a full prefabricated base to unload, and move up to above the ice cliffs. This is what the helicopter was mainly for - a sky crane. With a combination of very skilful flying and good teamwork, the unloading went well. Once the unloading had been done, the various groups dispersed. A building team remained to construct the four pre-fabricated huts that would form the base. The geology team set off for the Shackleton Mountains region. Another team set off to survey glacier grounding lines on the East coast of the Filchner Ice Shelf. 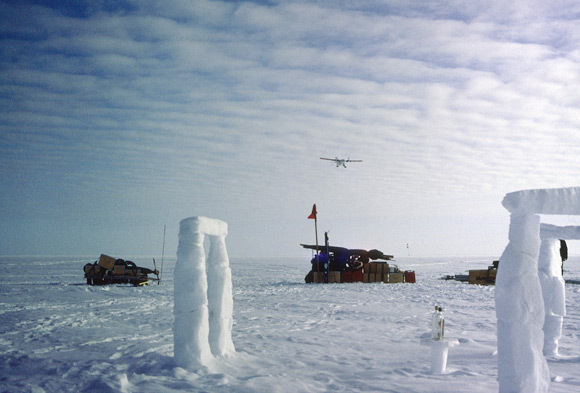 The Pole team started working on surveying landing sites and laying refuelling depots for the Twin Otter to reach and return from South Pole, since the Americans at Amundsen-Scott weren’t going to refuel it. 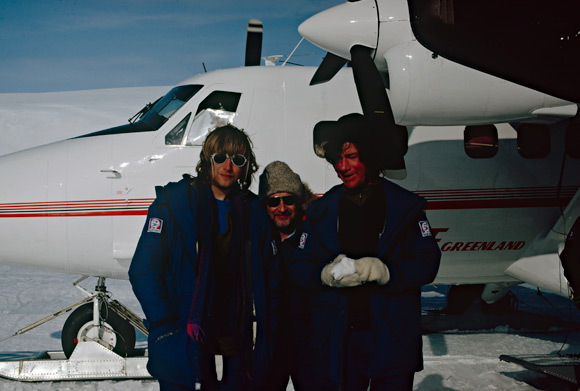 And we were flown out to the Filchner Ice Shelf. Myself, one of the GLACE crew, and Jeff, raring to go. In order to do our validation work, we needed to find a location under the ERS-1 satellite track, as flat as possible, and free of obstructions or significant topography within 50km or so. 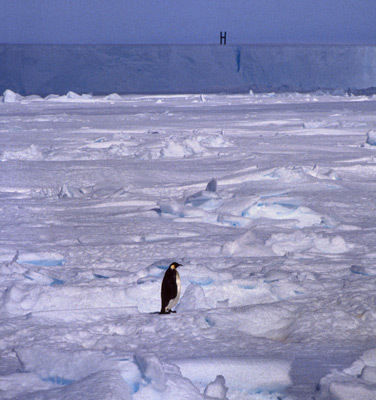 The middle of an Antarctic ice shelf was therefore the ideal location, provided there were no crevasses. There wasn’t a huge amount of time to choose a site, so we were quite fortunate to find a suitable spot more or less in the middle of the Ice Shelf, at S80° 06´, W41° 53´, which we would later dub “Snowhenge”. We were equipped with three tents, two excellent Yamaha snowmobiles, a UHF radio to keep in touch with the Aurora (and as it turned out the Australian Flying Doctor …), and plenty of supplies. Although the pyramid tents were Norwegian-spec single skin design, rather than the seemingly more robust, but much heavier British twin layer version, they were fine. Generally speaking the quality of equipment and supplies matched or exceeded British Antarctic Survey standards. The only problem was this: it was now mid-January, and the sun was sinking towards the horizon. By this point, most deep-field parties such as ours were wrapping up their work and preparing to be flown back North. We had not begun, and yet we’d planned at least a month’s fieldwork. Our work schedule from then on was to be governed by the heavens, or to be more prosaic, the orbital paths of the ERS-1 satellite and those of the GPS constellation. ERS-1 would pass directly overhead every 3 days. At these times, Jeff needed to get scatterometer data. The GPS constellation was still in its infancy in 1991, and we only had sufficient coverage (3 satellites visible with reasonable separation) for 4 3-hour periods every day. Since there were only 3 of us, it soon became clear that we were going to have to split the work between us. The scatterometer was quite cumbersome, and Jeff really needed Peter’s assistance to move it. The GPS surveying, on the other hand, could technically be done by one person, even if this was an absolute no-no for Antarctic fieldwork. Pragmatically, there was no other choice. But we tried to take what precautions we could. 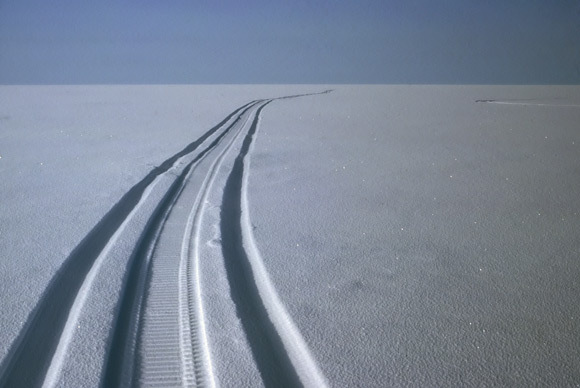 First, we surveyed a 40 km route southwards along the ERS-1 orbital path, taking two snowmobiles and carefully checking for crevasses. This established a path I could later follow alone. We also checked out several parallel routes offset 10km east and west. This determined a safety area in which we could build up our ground survey. To the east we did discover some crevasses, but they were large, open, not in our way, and easy to spot given good conditions. A more crevassed area was found to the north west of Snowhenge, in the direction of Berkner Island, so we decided to position our survey area mainly to the south of our camp. Peter, David & Jeff, and scatterometer: furthest South official photo. We then settled into a routine. Since Jeff & I were sharing a tent, and Peter was enjoying his polar superhero fantasies alone, it ended up with one or the other of us clambering out of the tent at some ungodly hour trying not to wake up the other one. The theory of the GPS work was fairly straightforward. 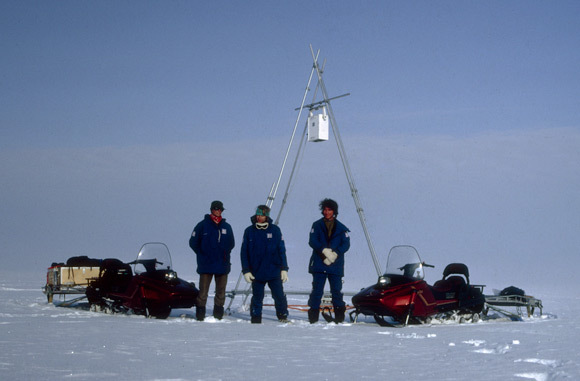 One antenna was strapped securely to a snowmobile, and a receiver was hooked up to it. The receiver sat more in less in my lap. The second antenna and receiver were set up at the camp. The idea was to use the differential method, recording two signals and post-processing to remove errors in the track recorded by the moving receiver (you don’t have to do that these days - young people today have it too damned easy!). In addition, to help things along, it was generally a good idea to stop every kilometre or so to let the mobile receiver get a better fix. And, based on the advice on the NERC experts, it was also a good idea to switch off all possible sources of interference, including the snowmobile engine. This was not something I felt all that happy about, especially when alone, at 3am, 40km from camp, at around -25C, and with no radio contact. Actually, there was no way on Earth I would have done that with a BAS-issue Bombardier Skiddoo snowmobile, but the Yamaha was much more confidence inspiring. And we had an agreement that if I didn’t turn up by a certain deadline Peter would come to look for me, following my tracks (there was a bit of a flaw in that plan, considering that Filchner Ice Shelf is quite a windy place, and that wind and whiteouts can rapidly conceal snowmobile tracks), and I had a survival pack. Well, it all turned out fine, but yeah, it was bloody stupid. But we’d come all that way and I wanted my data. Did I mention -25C ? Well, that was something that we hadn’t fully factored in. Probably, had we been backed up by a full national program logistics organisation, somebody might have pointed out that at such temperatures, batteries might not perform quite to optimum levels. The first sign I got of this was returning to camp on one of the first trips, and hearing a strange high pitched sound. This was actually not one of my team-mates snoring, but the second, reference Ashtech receiver using up it’s last few millivolts to emit a warning “battery-low” buzz rather than saving and securing it’s RAM data. This was, in my colourfully expressed opinion, a bit of a design flaw, and a sound I would come to dread. Essentially it meant that the post processing would be tricky, and in some cases impossible. Certainly, it couldn’t be done in the field with the primitive laptop software we had. Ah yes, the laptops. At one point, we noticed that the laptop hooked up to our ARGUS weather station was showing remarkably steady weather conditions. Temperature, wind speed, wind direction, humidity, none had changed for ages. At this point somebody noticed that the laptop’s liquid crystal display (this was 1991, remember) had frozen solid. Oh well. After it warmed up it was fine. When not surveying in one way or another, we carried out some more traditional glaciology, digging snow pits to record melt horizons (which could be very significant for the ERS-1 radar altimeter echoes) and measuring 10m depth temperature profiles using a superbly hand crafted set of thermistor cables. These data, together with the weather station data, could be used in future to plug into out model of how the ERS-1 13.8 GHz radar waves interacted with and penetrated into the snow. On days when ERS-1 was not overflying us, Jeff used the scatterometer and associated equipment to measure physical properties of the snow which combine to reflect the radar signal. And we put the snow blocks extracted from the snow pits to good use, building the structure which gave our camp - and this website - its name. Although things started out well, some snags were on the horizon. First of all, our generator broke down, and we were unable to recharge batteries, including our radio battery. The glacier survey team turned up and brought us a new generator, but also requisitioned a large proportion of our fuel reserves, seriously restricting our GPS surveying. It seemed that in general there was insufficient fuel to satisfy all the fuel parties’ snowmobile needs. We were also running low on paraffin for heating and cooking. And the scatterometer suffered a broken diode, making it unusable. But the worst blow fell further south. While landing at a depot towards the south of the Ice Shelf, the Twin Otter grazed an unspotted crevasse and tipped slightly into it. It escaped with a damaged ski, which was extremely lucky in the circumstances, but there was no way to repair it. This was the final straw. The GLACE crew had no option but to fly all the way to Canada to get it fixed. This took several weeks (a Twin Otter’s top speed is about 120 knots), and during this time, our field party was effectively stranded. We had insufficient fuel to travel overland to Blaenga, or indeed much anywhere, and we were well out of helicopter range. Fortunately nothing went wrong, and the Twin Otter eventually returned, bringing as a bonus a new diode for the scatterometer. But by this time, a late field season had turned into an extremely late one. Nevertheless, Monica wasn’t going to give up the Tent, and all efforts were focused on that. Before, however, we were to be evacuated from Snowhenge to a location from which, if necessary, we could reach Blaenga under our own steam (and in Peter’s dreams). We still wanted to try to get a second dataset in a more plateau-like environment with undulating terrain, and we had selected a site on Coats Land, which we dubbed “Newhaven” - as it turned out craftily concealed in a hollow and invisible from a km or so away. We packed up Snowhenge, and the Twin Otter arrived to carry us to our new home in the hills. Soon after we arrived, a snowmobile party from Blaenga turned up, bringing Elisabeth and Axel to join us. 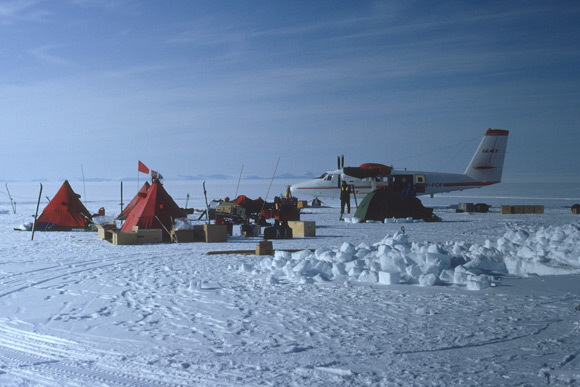 Meanwhile, the South Pole party had finally got going, delivered by the Twin Otter, to start the search for The Tent. There are conflicting stories about what actually happened next. According to the South Pole log the ground-penetrating radar was never used. 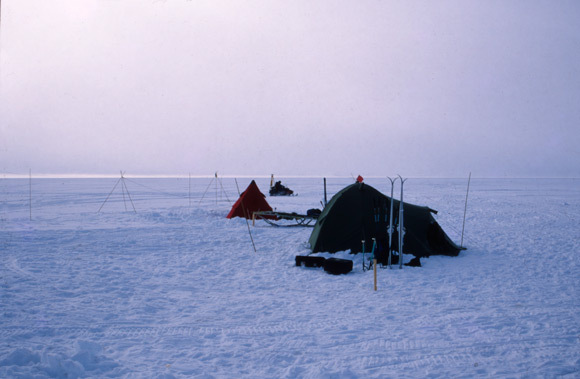 However, Jeff recalls that the team claimed to have used it and to have found a cavity in the snow close to the predicted location of the tent. Personally I’m skeptical, but either way, the Tent was not found. There’s also some contradiction about whether or not the US National Science Foundation supported the Tent search. Again according to that South Pole log they did, but my recollection from field radio chit-chat at the time was that there was some serious resistance in-situ - indeed, we had the impression they were practically hostile and refused to even allow the team to enter Amundsen-Scott base. [Blaenga] "Blaenga, Blaenga Station calling Amundsen-Scott"
[Blaenga] "Yeah, hi, er, look, we'll be dropping in tomorrow to pick up Amundsen's Tent"
[A-S] "Say again? What tent ?" [Blaenga] "Amundsen's Tent. He left it there in 1911"
[Blaenga] "Hello ? Amundsen-Scott? Do you read?" [A-S] "Blaenga, yeah, um, you, er, know that it isn't here any more, right?" Meanwhile at Newhaven things were getting a bit gloomy. It was now getting darker at night and quite chilly, and we had very little idea of what was going on, generally. The option of travelling to Blaenga by snowmobile was looking more likely, but we were not well equipped, or experienced, for such a journey. Conserving fuel also restricted our field work, and morale was declining. I seem to recall that the scatterometer was either not working, or its frame had collapsed, but for my part I was able to do some basic GPS surveying. This time, rather than a long, along track grid, I settled for a cross-shaped survey centered on Newhaven. Elisabeth had her own work to do, digging pits for snow samples, and we took advantage of these to make more thermistor measurements. I do remember that we set up a hot shower tent, though. That was definitely a high point! Eventually we were airlifted out and back to the Aurora which had returned to the vicinity of Blaenga. But this was not the end of the saga. Blaenga had been closed down for the winter, but Monica’s team was still as South Pole, and apparently were not making much progress. She was reluctant to leave, and with the weather closing in on the Aurora, emotions were rising and things were getting tense. And yet, this was the Antarctic, and it had a few gifts for us. We were blessed with several days of gorgeous weather, stunning, endless sunsets, and the visit of a very chilled-out group of curious emperor penguins (and some of their Adelie friends). These days I’d have to pay $20,000 for an experience like that. But eventually, some vestige of common sense, and the combined pressure of the Aurora’s captain and the GLACE crew won over, and the Pole team were pulled out. The Twin Otter immediately set off North West in the direction of the British Rothera base in the Antarctic Peninsula. And the Aurora left almost as quickly. 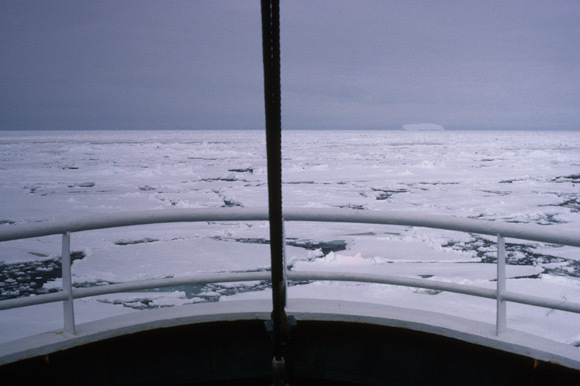 The return journey was uneventful, once we had left the Weddell Sea, although we had a very strange encounter when the bridge watch reported seeing the conning tower of a submarine rapidly heading south into the Antarctic night. I volunteered for watch duties and spent most of my time on the bridge, hearing stories of the Lofoten Islands from the captain. We stopped off for a few days at Grytviken, in South Georgia, which was a pleasant surprise, before finally returning to warmer waters and summer in Uruguay. Relations with Monica remained tense, and she kept herself largely to her cabin. My own relationship with Monica became extremely strained, and was only more or less repaired as we finally went our separate ways some 4 weeks later at Paris airport. 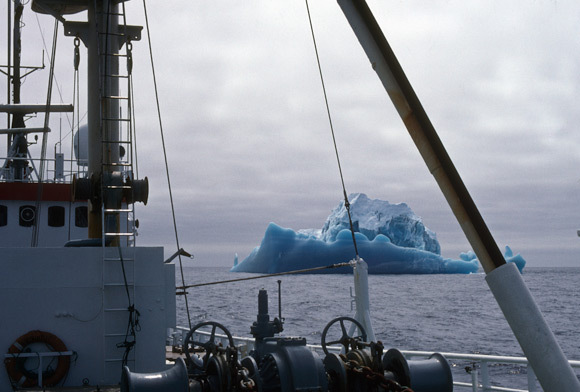 This article is the second in a 4-part series about the Aurora Programme, a privately-funded expedition to Antarctic which took place in the 1991-1992 austral summer/autumn. Read Part 1 here. Towards the end of December, the MV Aurora reached the edge of the sea ice, around 25°W and about 100km off the coast of Coats Land. The plan was to get as close as possible to the coast and then work south west to approach the Filchner Ice Shelf. 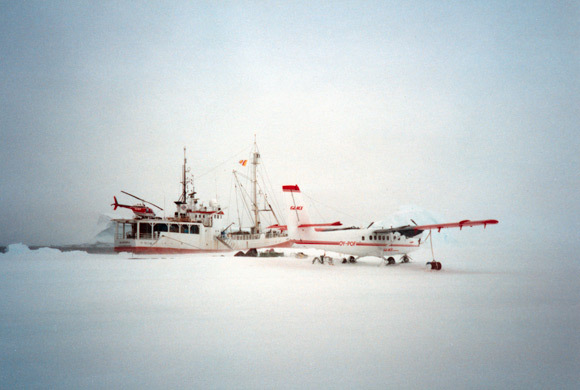 Somewhere along the way we hoped to find an area of fast ice where the ship could moor, be unloaded, and where we could rendezvous with the GLACE Twin Otter aircraft that would support the field parties. Also, a base was to be built using four pre-fabricated huts, designed to endure for at least the planned three years of the Aurora Programme. The route we were following was very similar to that taken by Shackleton’s Endurance in 1913, and just like the Endurance, the Aurora ended up stuck fast in the sea ice, a couple of days after Christmas. For the first time since leaving Montevideo, the propellor stopped turning and we could get some sleep. To some extent, this delay was a relief, but it was also delaying our arrival still more, and the time pressures were growing. We remained stuck for four or five days, and spent the time practising skiing on the sea ice and generally preparing gear. 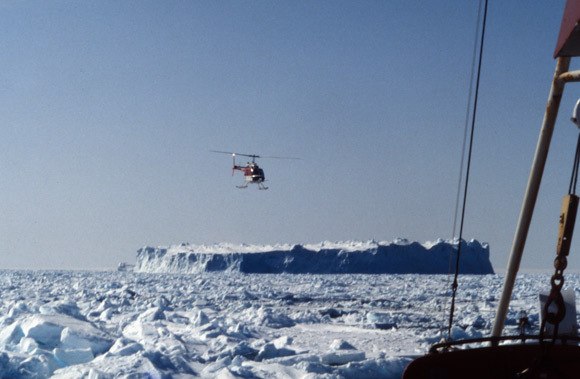 The helicopter was also unpacked and made flight-ready, and undertook some scouting expeditions looking for open water. I got my first ever ride in a helicopter on one of these flights. The ship’s crew were pretty blasé about the whole thing. The Aurora was built for such conditions, and they welcomed the rest. But on the science side we were getting restless. On New Year’s Eve a small lead opened up and we managed to edge forward a bit. We’d come into range of the British Antarctic Survey’s Halley Base, and decided to drop in to say “hi” with the helicopter. As a joke, we got the cook to bake a pizza and flew into Halley, knocked on the door, and asked who had ordered it… Being British, of course, the Base Commander could not take this in the spirit it was intended, since we were not an Establishment-sanctioned expedition, and took the quite ridiculous jobsworthy line that he could not formally welcome us. However, the Base staff were delighted to have visitors, and several of them were flown back to visit the Aurora - including the Base Commander. But generally the experience just highlighted how absurd and stuffy the British could be then - and probably still are. It also confirmed to me that I felt far more comfortable in the much more easy-going, egalitarian and mutually-respectful Scandinavian atmosphere of the Aurora Programme. The sea ice was now breaking up, and a polynya was forming along the coast. The captain audaciously took the Aurora to within a few lengths of the ice cliffs and we sailed south west at full steam ahead. But the ice was still around: despite not being an ice breaker, the Aurora was frequently rammed into ice at full throttle to get through. This of course maximised the engine noise in the Propeller Suite. Eventually one of the ships stabiliser fins broke off, ripping open part of the hull, and the ship took on water. A diver went down to weld the hole shut. Finally we reached open water, and a day or so later we met up with the German icebreaker, Polarstern, which was heading a little further west to the German Filchner Station. On board was our MSSL colleague Dr Jon Bamber, who was also working on ERS-1 validation activities. We had a quick exchange of courtesy visits by helicopter, and to the evident relief of our Norwegian colleagues managed to persuade the Germans to sell us some beer. The captain was getting worried that they’d start distilling the diesel if they got desperate. I haven’t recorded the date, but in early January, we reached an area of fast ice around S77°, W34° which suited our purposes. The Aurora was moored, secured, and the unloading started. 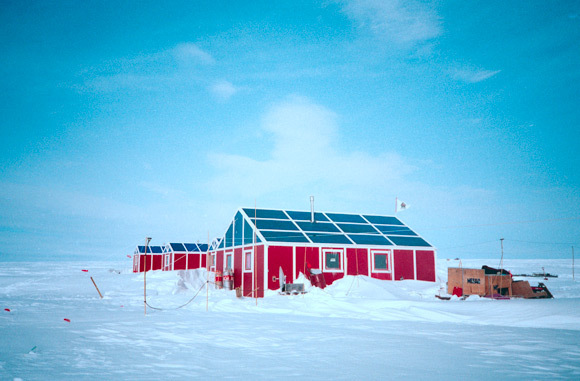 While the science teams were in the field, the semi-permanent base, Blaenga, was to be constructed on the adjacent land ice, and the Aurora was to embark on an oceanographic cruise. A day or so later, the Twin Otter arrived, after an epic flight down from Greenland, and we were ready to start work. 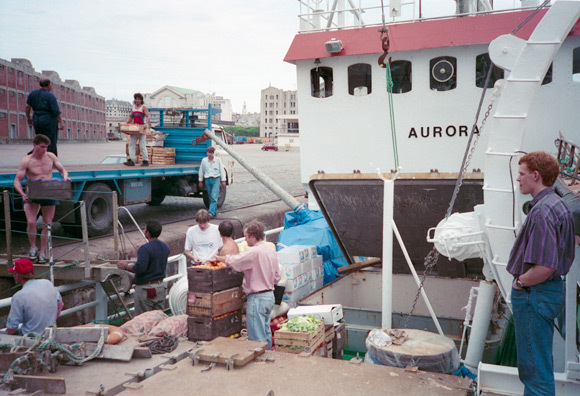 This article is the first in a 4-part series about the Aurora Programme, a privately-funded expedition to Antarctic which took place in the 1991-1992 austral summer/autumn. I’ve tried to be fair and accurate in the telling, but it took place a long time ago, and was shrouded in controversy. As far as I can tell, the full story of the Aurora Programme has never really been told. Certainly there is very little you’ll find about it on Google, and what little you will find is not happy. But while there were plenty of negatives for the critics to get their teeth into, they were by no means the full story. So here is one side - and I emphasise, my side - of a very multi-faceted story indeed. I’d like to thank Dr Jeff Ridley for helping to jog my memory, and providing valuable feedback. I have included a few passages which originated from Jeff, but the responsibility remains fully my own. A note on the photography: all the photos in these articles have required quite a deal of attention to get them even presentable. They’re strictly documentary! So, why, now, in January 2014, did I decide to write about a long forgotten expedition which took place over 20 years ago ? The trigger was the hubbub around the temporary stranding of the Russian ship Akademik Shokalskiy, along with its private expeditionary team of scientists and tourists. 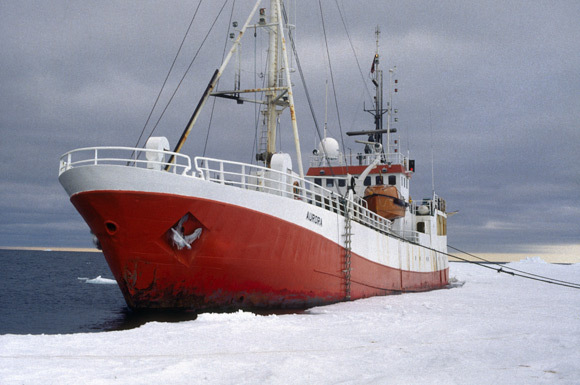 Our ship also got stuck in the ice, although with little fanfare. The principal actor of the Akademik Shokalskiy expedition, Professor Peter Turnley, is weirdly reminiscent of the leader and driving force of the Aurora Programme, Dr Monica Kristensen. Both have an obsession with a heroic age explorer, in Turnley’s case Douglas Mawson, in Kristensen’s case, Roald Amundsen. Both - perhaps - used science as veil disguising their more personal agendas. Both are charismatic and driven. And both, regretfully, could be charged with over-estimating their abilities and neglecting basic risk management. The roots of the Aurora Programme lie in Monica Kristensen’s desire to detect, recover and return to Norway the tent which Roald Amundsen had left at South Pole on 14 December 1911. Several years earlier, she had led a combined science/adventure expedition attempting to recreate Amundsen’s South Pole trek together with British glaciologist, Neil McIntyre. Although not fully successful, this expedition was widely applauded, and set the stage for the following, far more ambitious steps. Kristensen’s objective was to present Amundsen’s tent as the centrepiece of the 1994 Winter Olympics in Lillehammer, Norway. From the start she wanted this to be within the framework of a sophisticated, relevant science programme. Towards this, she managed to attract considerable logistic support and sponsorship from Statoil in Norway. At that time, more so than now, non-scientific travel to Antarctica was frowned upon and impeded as much as possible by the signatory nations of the Antarctic Treaty (including Norway). So it was necessary to acquire at least a minimum level of approval, if not complete acceptance, from the Establishment. Although not affiliated with the Norwegian Polar Institute, Kristensen did manage to get scientific backing and involvement from the Norwegian Meteorological Institute (KNMI). And she also found some fellow travellers through Neil McIntyre, at University College London’s Mullard Space Science Laboratory (MSSL). A team at MSSL, led by Dr Chris Rapley, and recently recast as the “Climate Physics Group”, had been involved in satellite remote sensing of polar regions for some time. I joined this group, from the British Antarctic Survey, in 1989. Coinciding with Kristensen’s plan for a 1991/2 expedition was the launch of the European Space Agency’s ERS-1 remote sensing satellite. 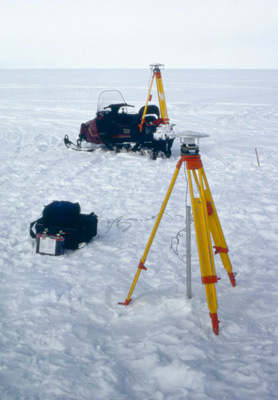 MSSL provided much of the core science team working on data analysis algorithms for the satellite’s instruments, with special focus on land ice, and we were very interested in the opportunity of acquiring simultaneous ground validation data to verify our techniques. ESA were also keen to support this, and we received additional support from the British Antarctic Survey, who while not officially endorsing the expedition, agreed to nominate staff to sit on the steering committee. It was also agreed to provide logistical support later in the season to a 4 person glaciology team from the University of Stockholm, led by Dr Per Holmlund. A planning meeting was held at the Royal Geographical Society in London - a venue which itself lent still more respectability - and a three year plan was sketched out, geographically focussed on the Filchner Ice Shelf and bordering lands to the East and Southeast. And of course a land route lies along the ice shelf towards the South Pole, and Amundsen’s tent. 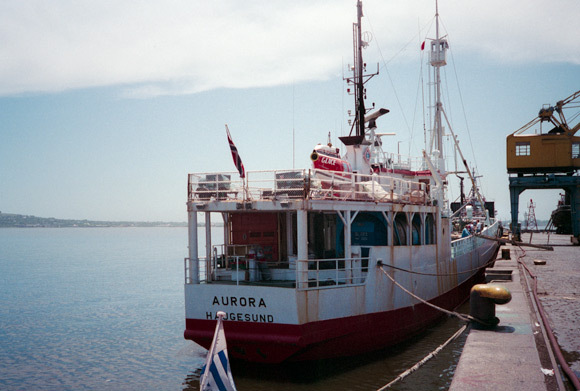 The overall plan was baptised “The Aurora Programme”, after the expedition ship, the MV Aurora. The next step was to hold a 3 day science planning workshop in Oslo. 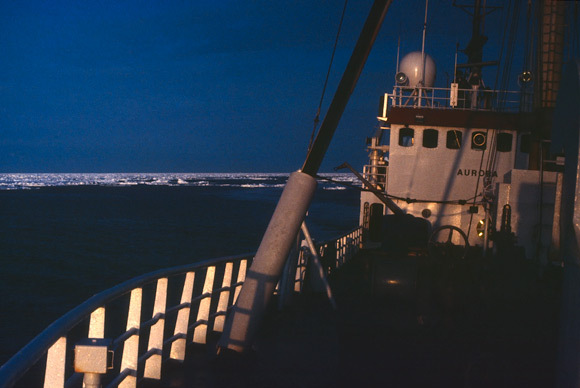 The science scope encompassed physics, glaciology, oceanography, geology and meteorology. As well as from people included in the field party, scientists from several supporting institutes took part. All in all, a good confidence-building activity. The Aurora was due to depart from Norway in October 1991 to sail to Montevideo, where we would catch up with her in late November. In the meantime we had to prepare and ship our equipment. The MSSL field team was led by Dr Jeff Ridley, a talented physicist, with me making up the numbers. Together we wanted to provide ground data to calibrate the range and the reflectivity power measurements of the ERS-1 radar altimeter. Over the floating ice shelf, the radar altimeter could give unprecedented coverage of the surface elevation (after correction for the geoid) and therefore the ice thickness, given a few well accepted assumptions. We wanted to test some of these assumptions, in particular how far the radar signal penetrated into the lower density top layer of the ice before being reflected. We had a model for this, but to verify it we needed in-situ temperature profiles, density and independently measured elevation and reflectivity. For the elevation measurement, the UK Natural Environment Research Council (NERC) had kindly lent us 2 new-fangled Ashtech GPS receivers, the size of microwave ovens, and worth something like £30,000. They also sponsored a training course for me to learn the rudiments of differential GPS surveying. The KNMI provided several encapsulated ARGUS automatic weather stations. 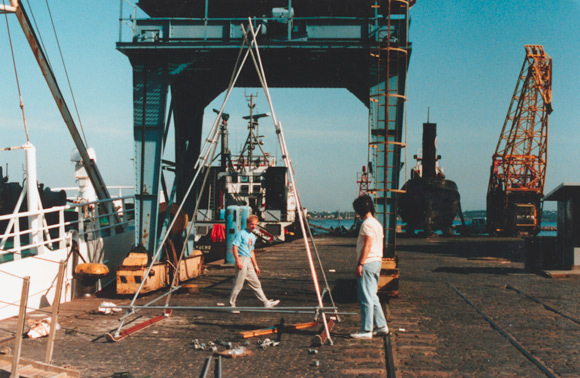 But the piece-de-resistance was the MSSL custom-built scatterometer, which measures surface reflectivity at radar frequencies. 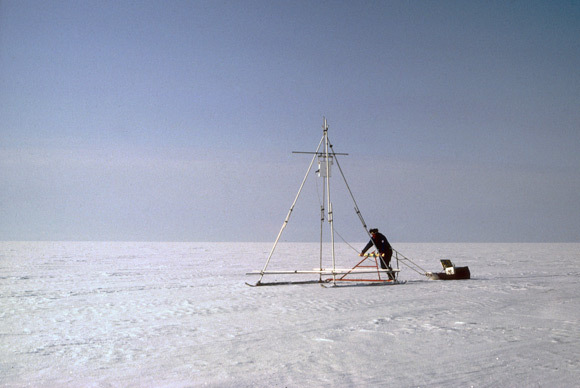 An arcane construction made from building site scaffolding and mounted on two skis allowed the scatterometer to be suspended several meters above the snow, and pushed along by Jeff in true Scott Of The Antarctic style. It was quite a sight (not content it with freezing it to death, the following year Jeff dragged the poor thing all over the Simpson Desert in Australia). The first glitches hit us in Montevideo. First of all, our air cargo had not turned up. It was still stuck in Madrid for whatever reason. The local handling agent moved Heaven & Earth to get over the serial “mañanas” and eventually it turned up. At the same time, a strike by dock workers prevented us refuelling and loading provisions. We ended up leaving Uruguay some 3 weeks late, which was not terribly good news as apart from the $8000 daily cost of keeping the Aurora in port, our plan was to base our field work near to 80 degrees South, which meant that by the end of January we had to be wrapping up. It gets dark and cold out there after that. The Aurora was not a large ship. It started out life as a seal hunter. As seal hunters go, I think it was pretty large, but as Antarctic expedition ships go, it was, shall we say, snug. It had one accommodation deck with the galley, mess / day room, and crew quarters; an extension at the rear for expedition member bunk rooms, affectionately known, and with good reason, as The Propellor Suite; a converted hold towards the bow which acted as the science / logistics room, and the bridge deck with the bridge, radio room, captain’s quarters and expedition leader’s quarters. Oh, and a small but perfectly functional helicopter deck, complete with GLACE (Greenland Air Charter) Bell Jetranger helicopter. To make up lost time, the Aurora pointed due South and went absolutely flat out (all of 10 knots), putting a severe strain on the engines and fuel reserves. On a number of occasions small fires broke out in the engine room, requiring us to follow the evacuation drill and assemble on deck in survival suits. Crossing the Furious Fifties in such a small ship was seriously entertaining, with roll angles up to a nauseating 45 degrees. Many lunches were lost. At this point I should say that apart from our field party itself, generally I will avoid using names, mainly because I can’t remember everybody’s surname. But generally we were split into three groups: the ship’s crew, the science / expedition team, an experienced Danish-Norwegian polar logistics group, as well as a Swedish helicopter pilot and a Norwegian Radio-TV journalist making a documentary about the trip. In total the complement was about 20 people. The “ERS-1 Validation Team” was composed of myself and Jeff Ridley, with support from Peter Webb, a young Cambridge-educated, fiddle-playing outdoors fanatic with some experience of Svalbard but otherwise new at this stuff. We weren’t likely to get into too much trouble on the ice shelf, and since I already had some experience of the Antarctic and the neighbouring Ronne Ice Shelf, this was considered adequate. Later in the season we were also to be joined by University of Stockholm glaciologist Elisabeth Isaksson and field assistant Axel Bodin.